But regardless of the many strands of their fictional web, each novel stands easily on its own. Read it, enjoy it, put it down, it's finished. Does Aloysius survive? The answer is in the duo's latest novel, ''Dance of Death,'' which is not only a fabulous, absorbing, wild ride of thriller, it turns out to be part two of what will have to be at least a three-part serial. Because while it enormously expands the tale of the fatally strange Pendergast family -- especially the relationship of the two brilliant brothers -- it ends on another dang cliffhanger. And for fans of the Preston/Child Pangea, it is an encyclopedia of appearances or references to pretty much the entire canon. ''Dance of Death'' opens with a college professor killing himself, in a most grisly way, in a New Orleans lecture hall full of students, some of whom are splattered with his blood. Later, another man drops to his death from his Manhattan apartment through the glass roof of a fancy restaurant. After that, an FBI agent is orally speared by an old bayonet, in his own home in Washington, D.C. The deaths, of course, are related. How so would be giving away too much. If you are reading this letter, it means that I am dead. It also means I died before I could accomplish a task that, rightfully, belongs to me and no other. That task is preventing my brother, Diogenes, from committing what he once boasted would be the ''perfect'' crime. ... Diogenes' threat is too amorphous for me to take to the FBI or other law enforcement agency, since he contrived his own false death some years ago. A single, dedicated individual has the best chance of preventing my brother from carrying out this crime. That individual is you. Also on board from the Preson/Child crew are New York Times reporter Bill Smithback and his wife, Nora Kelly, and Margo Green. The three have in common the Museum of Natural History (dating to ''Relic''), where Kelly is helping put together a new exhibit that will include some ancient American Indian ceremonial masks, and Green, editor of a museum publication, wants the masks given back to the tribe that lost them, years ago, to the museum. Also prominent at the museum is a diamond collection that includes ''Lucifer's Heart,'' a unique, and huge, red diamond. This resounds of a theme in Preston/Child that includes the red object of ''The Ice Limit,'' one of whose characters is Eli Glinn, who also plays a role in this book, when his company is hired to produce an important character profile of Diogenes. Diogenes is a terrific character, as brilliant in his complete sociopathy as Aloysius is in his ability to combat evil. Perhaps Preston and Child, after creating the amazing Aloysius, felt they needed to come up with his equal from the dark side. The crime that D'Agosta hopes to foil within one week's time is one that Diogenes has been carefully planning for almost 20 years. 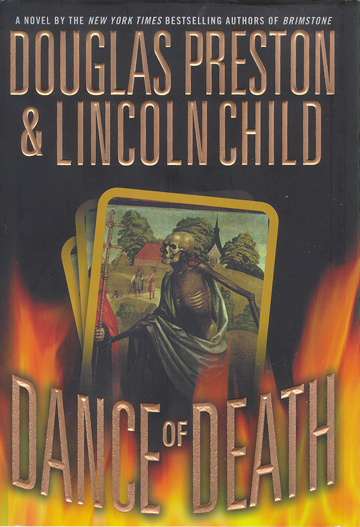 The cliffhanger that ends ''Dance of Death'' raises the question of what Preston and Child will do next, even as it raises the interest of their fans. It reminds of the Harry Potter series, except that J.K. Rowling has always said there would be seven novels in young Harry's tale. Preston and Child will have to produce at least one more book in this elongated tale, or their fans will beat them about the head and shoulders. But after that? It is delicious to anticipate.